Rear Suspension Twin Girling gas units, 3-way adjustable for preload. 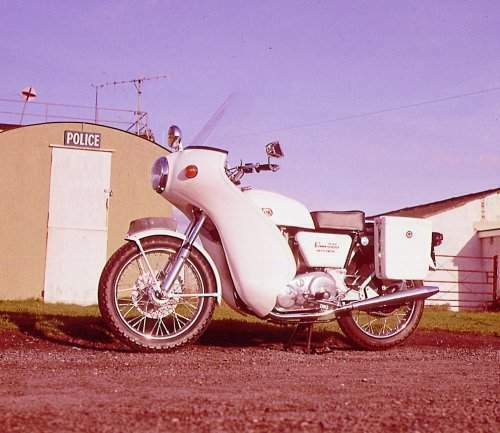 To get back into the Police and military market, Norton recruited Neale Shilton, Triumphs Police sales manager, who developed a Police bike against the often considerable resistance and envy of other members of the Norton management- I recommend reading Shiltons book "A Million Miles ago". The minimum outlay for tooling meant that the fairing was bought in from Avon Fairings. 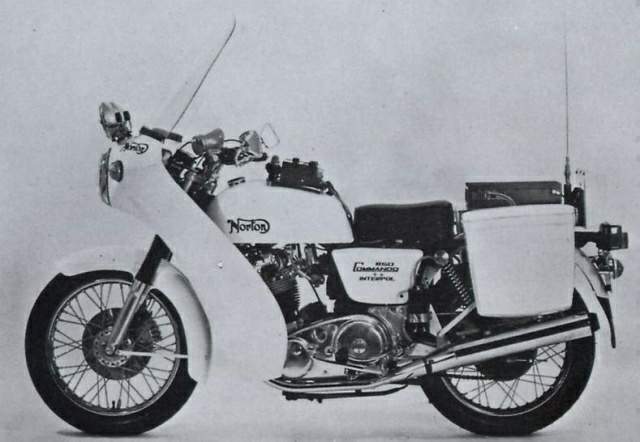 Police safety regulations demanded the petrol tanks had to be made from metal, not glass fibre; as all Norton Commando tanks at the time were made from glass fibre, Shilton used up steel pressings for slimline featherbed petrol tanks, equipping them with a bottom that fitted the Commando frame. The speedo had to be accurate, so a "non-pair" of Chronometric speedo and magnetic rev counter were used. Some petrol tanks had a boxed-in section on top for the radio equipment of the day; most were fitted with the (terrible) "fits all but nothing rightly" Craven carriers and panniers, employing 16 half clamps, 30 distance pieces, 6 stays, and general shoddyness as a main design feature.